Maureen: Although you would think we could have this on Meat Free Monday, we can’t, because it’s got bacon. Maureen: Agreed. Bacon makes everything better. What do you think? 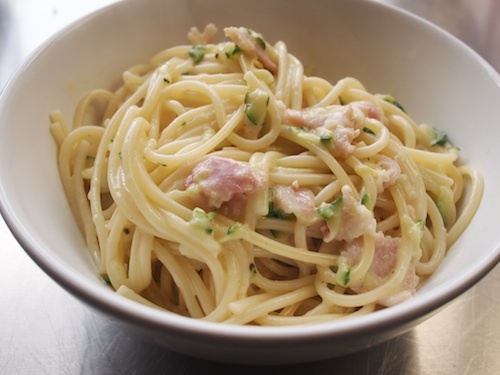 Maureen: Do you like it better than the other carbonara I made from Lisa Faulkner’s cookbook? Andrew: Both are good, but to be honest, I don’t remember the other one all that well. I just remember that it was fine. Maureen: This one is different in that you add some grated courgette to it. I like that it’s adding more vegetables, but it seems to me that it’s no longer a carbonara if you’ve got courgette swimming in the sauce. Andrew: I see what you mean. This is fine. It’s not fantastic, but it’s not a disaster. Nicholas: I agree with Andrew. Maureen: I’m not sure I would make this again. I’d probably make the Lisa Faulkner one, or maybe even a different recipe altogether, when I make carbonara again.